A. T. Kearney is a management consulting firm with sixty-six offices in thirty-five countries. It helps our clients make changes, prepare for the future, and employ the right strategy. Johan Kestens, a partner in the firm, tells us how he sees the world changing, and how his impetus and energy has made the Vlerick Centre for Financial Services in Brussels a reality. We see as much change in one lifetime as twenty or thirty generations of Romans and nothing has prepared us for that. “A. 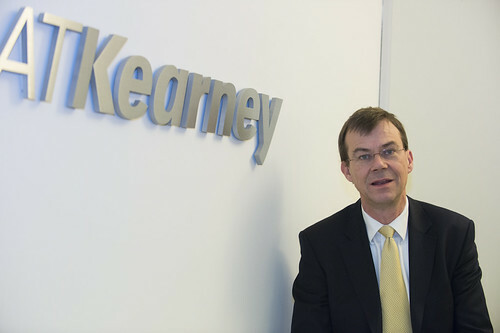 T. Kearney is a management consulting firm with sixty-six offices in thirty-five countries. We help our clients make changes, prepare for the future, and employ the right strategy,” says Johan Kestens, a Partner in the firm. Each partner at A. T. Kearney specialises in different fields and Kestens is no exception – his expertise is in the financial industry, specifically Banking and Insurance. Founded in Chicago, Illinois in 1926, A. T. Kearney has spent nearly a century assisting companies evolve as fast as technologies and business models do. Kestens, who leads the Brussels office, clearly understands the changes going on in the world, and he offers his insights based on not only the business world, but also the world in general. This is well illustrated by the choice of offices he has made for the company he manages. A.T. Kearney was one of the first tenants of the beautiful Royal Depot, an early 20th century warehouse, renovated in 2004, in the heart of the canal area. The atmosphere and feel is one akin to an ad agency where creative thought and the expression of ideas is encouraged, promoting an environment of collaboration between experience and enthusiasm.